Safeguard has chosen to align itself with GAF, the largest manufacturer of commercial and residential roofing in North America. GAFs advance quality shingles provide us with an opportunity to deliver a long lasting, warrantied product to our customers. Our installers are manufacture certified and trained, allowing us to deliver proper installations in accordance with GAF specs. Shingles range from standard architectural – which are used in most roof replacements – to the GAF Designer series, for a more distinctive look. Every style comes in dozens of color combinations for you to choose from, allowing you to create your dream home! Safeguard installs GAF timberline HD shingles, North America’s #1 selling shingle. The product gives you value and performance with a modern look. However, installing a new roof is more than just the shingles you choose. We install complete GAF roofing systems at Safeguard – from our drip edges to our ice shields, our synthetic underlayment and venting system installs are superior. The package of all these products combined allow us to offer you a GAF Manufacture warranty on your roof. Great value… architecturally stylish but practically priced, with a lifetime limited warranty. Beautiful look… features GAF’s patented “High Definition” color blends and enhanced shadow effect for a genuine wood shake look. Safer… Class-A fire rating from Underwriters Laboratories, the highest rating possible. High performance… designed with Advanced Protection® Technology, which minimizes the use of natural resources while providing superior protection for your home. Stays in Place… Dura Grip™ Adhesive seals each shingle tightly and reduces the risk of shingle blow-off. Shingles warrantied to withstand winds up to 130mph. Peace of Mind… Lifetime Limited transferable warranty with Smart Choice® Protection (non-prorated material and installation labor coverage) for the first 10 years. Perfect Finishing Touch… Use Timbertext® Premium Ridge Cap Shingles (in the West, use Ridglass® Premium Ridge Cap Shingles). GAF’s American Harvest line is made exclusively to enhance the color scheme of your homes exterior. This collection provides a modern architectural style with several different color patterns. The American Harvest Shadow lines offer a color application that result in an extra dimensional look. 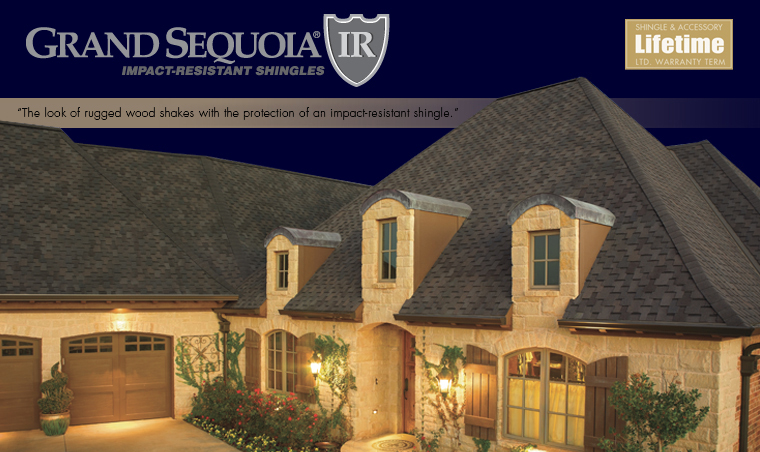 The shingle comes with StainGuard® protection that helps ensure the beauty of your roof against blue-green algae. Extra Dimension… Optimized construction and advanced color application techniques result in an extra dimensional look. Great value… architecturally stylish, but practically priced with a Lifetime Limited warranty. Highest Fire Rating… Class-A fire rating from Underwriters Laboratories. Higher Performance… designed with Advanced Protection® Shingle Technology, which reduces the use of natural resources while providing superior protection for your home. Stays in Place… Dura-Grip™ Adhesive seals each shingle tightly and reduces the risk of shingle blow-off. Shingles warrantied to withstand winds up to 130mph. Peace of Mind… Lifetime Limited Transferable Warranty with Smart Choice® Protection (non-prorated material and installation labor coverage) for the first ten years. Perfect Finishing Touch… use of Timbertex® Premium Ridge Cap Shingles. Camelot®: uncompromising performance and timeless beauty at a fraction of the cost of expensive slate or wood shakes. Country Mansion®: offers the look and charm of hand-crafted slate – perfect for historic properties. Grand Slate™: massive, extra thick tabs and specially-blended color palette create the look of real slate shingles. Grand Canyon™: the ultimate choice for a rugged, wood-shake look. 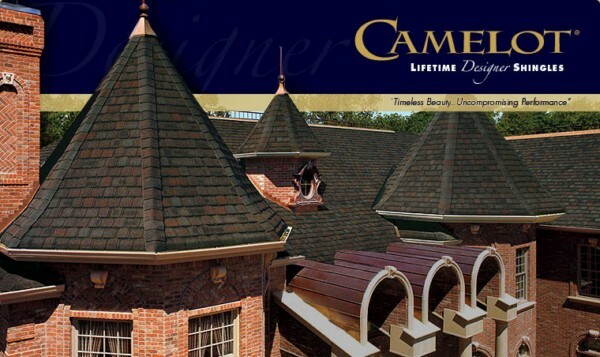 Camelot II: a new shingle that offers the look of the original Camelot shingles at an incredibly affordable price. Country Mansion II: for the look of original Country Mansion shingles at an incredibly affordable price. 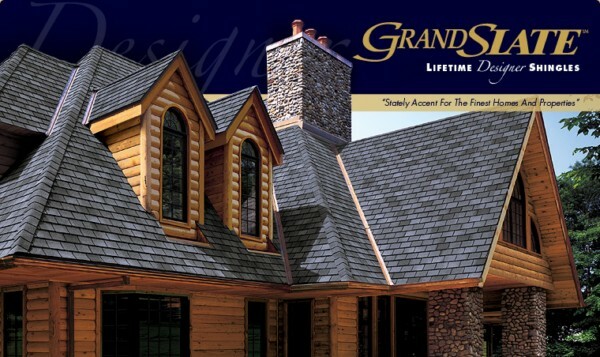 Grand Slate II: for the look of original Grand Slate shingles at an incredibly affordable price. Slateline®: equip with bold shadow lines and tapered cut-outs that create the look of slate at a fraction of the cost. 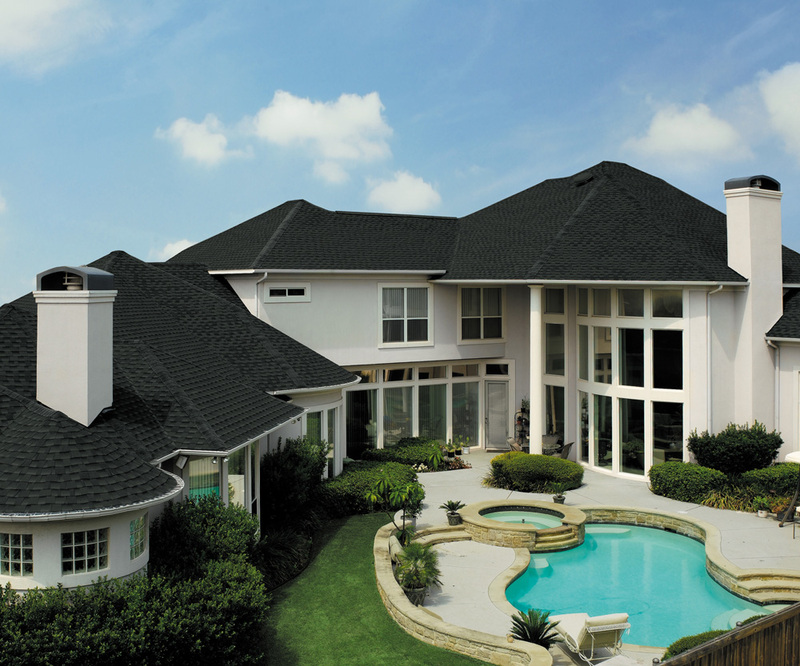 Grand Sequoia®: a patented extra-large shingle that creates a dramatic visual impact for prestigious homes. Capstone®: a classic, random-cut European slate that results in a timeless, turn-of-the century look. 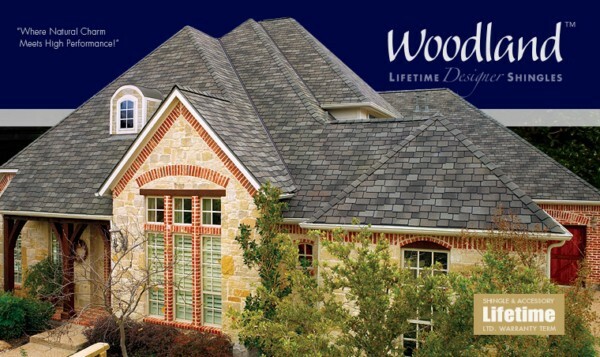 Affordable Luxury… GAF Lifetime Designer shingles are only a fraction of the cost of traditional slate or wood shakes. 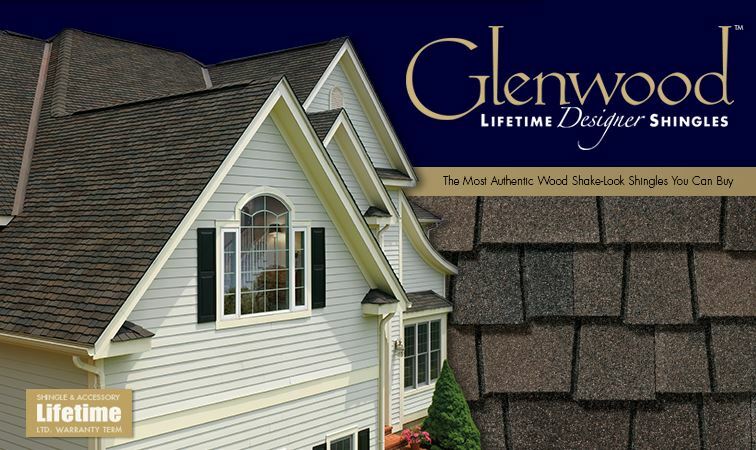 Sophisticated Designs… Artisan-crafted shapes combined with oversized tabs and dimensional designs result in a sophisticated beauty unmatched by typical shingles. Custom Color Palettes… Specially formulated color palettes are designed to accentuate each shingle’s natural appeal. StainGuard ® Protection… Helps assure the beauty of your roof against unsightly blue-green algae. Safer… Class-A fire rating from Underwriters Laboratories—the highest rating possible— and safer than wood shakes or plastic/synthetic shingles, which carry only a Class-C fire rating! Stays in Place… Dura Grip™ Adhesive seals each shingle tightly and reduces the risk of shingle blow-off. Shingles warranted to withstand winds up to 130 mph! This wind speed coverage requires special installation. See GAF Shingle & Accessory Limited Warranty for details. The Ultimate Peace of Mind… Lifetime Limited Transferable Warranty* with Smart Choice® Protection (non-prorated material and installation labor coverage) for the first ten years. See GAF Shingle & Accessory Limited Warranty for complete coverage and restrictions. *In this case, the word “lifetime” means that the original individual owner of a single family detached residence (or the second owner in certain circumstances) owns the property where the shingles are installed. For owners/structures not meeting above criteria, lifetime coverage is not applicable.